EJ urges you to judge a book by its cover only if you want your mind blown. EJ digs beyond the words on a page to flesh out the story between the lines. 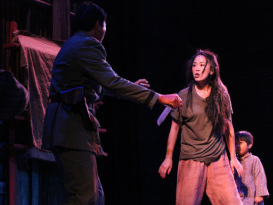 EJ most recently starred as KIM in Riverside Theatre's production of MISS SAIGON. Check back every week for a different video feature of EJ werking. Check out "Take Out." a hilarious short by Jonathan Lee and Justin Anthony Long that made it into the top ten of the Asian American Film Lab's 72-hour Shootout competition!